Smart fitness devices help you get the best workout, measure your daily activity and even monitor the quality of your sleep. You can get a range of specialised fitness trackers, or opt for a smart watch which contains numerous other great features to help you manage your digital life. Look out for the ‘Our Experts Love’ range to find fitness devices that have the latest and most useful features. And of course, if you want to see what’s on offer for yourself or find out more info, head to your nearest store and we’ll be happy to help. 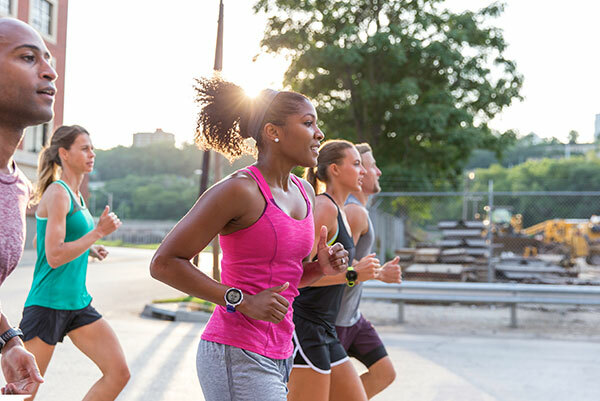 Fitness trackers can help you lead a healthier life. They let you monitor your daily activities such as steps taken, sleep, and sometimes heart rate, and can help you live a more active lifestyle. Picking between the different brands and models can be tricky, as some trackers offer essential monitoring for the basics, while others include advanced features such as heart rate monitoring and smart notifications to give you a more detailed view of your health and activity. What does a fitness tracker do? Fitness trackers are a great way to keep motivated. They track steps, distance, calories burned, and many also display notifications. They let you know your progress throughout the day and you can use an app for a more comprehensive view of your daily activity. Fitness trackers come in all shapes and sizes. They’re designed to be worn at all times so you’ll want to make sure that you pick a design that’s comfortable and stylish. Sizing varies for each brand, but we make it clear online and instore which size you’re getting. All of the fitness trackers have a size guide on the side of their boxes or on their respective websites. Do I need a heart rate monitor? Heart rate tracking makes calorie tracking much more accurate. With an app on your phone making notes of your resting heart rate and patterns, you can make a more informed plan of how to get and stay healthy. Should I buy a fitness tracker with a screen? 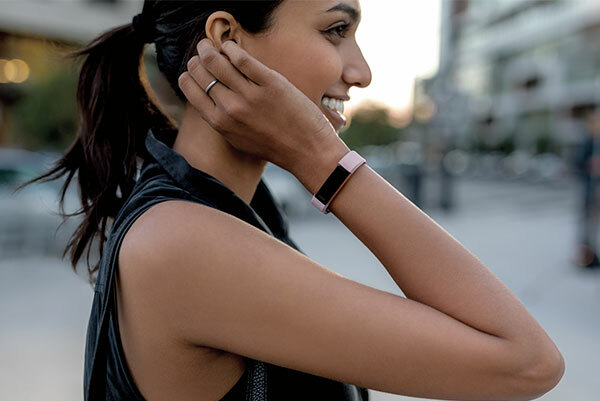 Bands with built-in displays let you keep an eye on the time and your fitness goals without your phone. They show you information such as a clock, your heart rate, and instant activity information, while some allow you to receive notifications from your smartphone or control music – great for staying motivated at the gym or when out running. Built-in displays vary from simply showing activity information to a smartwatch-style screen with full health monitoring and phone information. If you prefer fitness trackers without a screen, there are options such as LED lights that provide activity information and band-style trackers that can simply be synced with an app. Fitness bands are either rechargeable and will need to be recharged every few days, or are powered by watch batteries which can last up to a year before needing to be replaced. If you want to swim or shower with your fitness tracker, remember to check its level of waterproofing (IPX rating). Most devices are at least splash proof, but if you’re planning to track your swimming, look for a higher water-resistance rating. Can I track my sleep? Many activity trackers offer sleep tracking, so you can understand how long you slept for and the quality of sleep. How important is the app? The app is where you view the detailed information captured by your tracker, so is an important element in choosing the right band. If you have a preferred health app, you should check that your tracker supports that app, and that the tracker itself is compatible with your smartphone (although most will work with both Android and iOS devices). Sports trackers offer more functionality than fitness trackers and are ideal if you’re seriously into sports or fitness. They have more functionality which allows you to accurately track calories burnt, distance travelled, routes taken, and altitude changes for a much more detailed view of your progress and overall health than you’d get from a standard fitness tracker. What sports can they track? All sports trackers let you monitor running and cycling, while most offer swimming, mountain biking, cycling, skiing, snowboarding, roller skating, and rowing. Even if the tracker doesn’t specifically cover your chosen sport or activity, chances are there’s an app available to make it work for you. Are they compatible with my smartphone? All of the trackers we sell are compatible with current Android and iOS phones, with an increasing amount being compatible with Windows. We always list smartphone compatibility on our product pages. Many of the trackers feature dedicated apps, making it easy to track your progress. 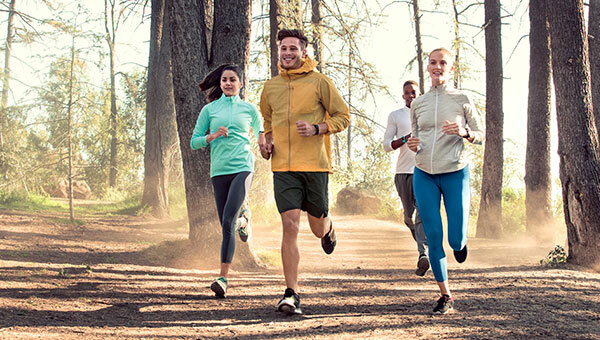 They can also be compatible with a range of popular running apps available for iOS and Android, so you can simply download the apps to your smartphone and start tracking your fitness. How detailed is the data? If you’re looking for in-depth analysis and additional fitness metrics, pick a device with the best app. Different apps provide different data and will help you understand your performance with features like VO2 max and more. Can I accurately track my distance? If you’re training for a marathon or running long distances GPS is essential for accurately tracking your distance and pace. A heart rate (HR) monitor will give you an indication of your overall fitness, so you can track how it will improve over time. If you’re a keen runner and want to keep your music close, look for a fitness tracker that has built in storage for music. This can be synced with Bluetooth headphones so you can run without your device. Can I swim and shower with it on? If you want to track your swimming, make sure you check the level of waterproofing on the device. Most devices are at least splash proof but if you want a more reliable waterproof or resistant design that can be worn in the shower it’s worth checking for a higher IPX rating. Battery life is key. Most sports watches last just under a week and some may need charging daily if you have the GPS running a lot. Choose a device that provides you with enough power to suit your everyday needs. Smartwatches give you information you need, when you need it. They send alerts from your phone, calendar, apps, and more, straight to your wrist, so you don’t need to stay glued to your phone throughout the day. From simple call and messaging information to full phone functionality, there’s a smartwatch to keep you in touch with what matters at all times. There are also thousands of apps available for you to download so you can personalise your watch to suit your lifestyle. What’s the difference between a smartwatch and fitness/sports tracker? Smartwatches are an extension of your phone, so are made to keep you aware of what’s going on at all times, while sports and fitness trackers are designed to predominately monitor health and fitness. While there are some that cross over, you should choose one that best reflects your needs. Most smartwatches offer some basic health and fitness tracking, but there are also lots of apps you can download for specific sports activities. 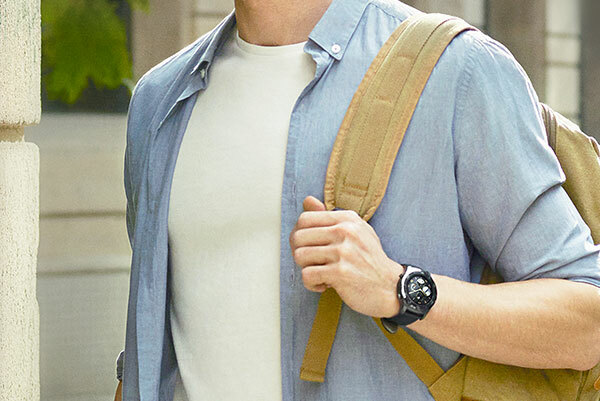 Pick a smartwatch you’ll feel comfortable wearing on any occasion. Everybody has a different style so choose the one most comfortable and attractive to you in addition to having the features you want. Most smartwatches are have full touchscreen functionality, hybrid watches offer the look of a classic timepiece with smart functionality. These will usually either have a smaller display within the watch face, or use vibrations and LEDs to alert you to notifications. Which notifications can I get on a smartwatch? All smartwatches alert you to incoming calls, emails, and text messages with silent a buzz on your wrist, which can help you discreetly check whether it’s worth dealing with right away. On some models, you can even respond to your messages and answer calls. You can also use some smartwatches as a navigation device to give you directions or for transport links and to control the music playing in your headphones. Most allow you to set different notifications for specific alerts to let you know what’s happening without the need to even check your wrist. Remember to check the compatibility of your phone to the watch – you’ll find this information on individual product pages. Apple Watches will only work with an iPhone, however Android Wear Watches are compatible with most smartphones, even if they aren’t Android. Which operating system is best for me? Whilst some smartwatches have their own operating systems, most use Watch OS, Android Wear or Tizen. Watch OS and Android Wear provide huge app stores with lots of choice and variety, while Tizen and other operating systems will have fewer apps available. Can I use contactless payments? Contactless payments are great for those who don’t like carrying a wallet. If you’re out for a run and need a bottle of water, a watch with NFC or Apple Pay might be the way to go. Does it have 4G compatibility? Some watches are now compatible with 4G, which means you can access the internet without needing a WiFi connection. These watches will require a data SIM and are great for staying connected at all times. Some watches have GPS so you can track your distance and use maps for turn by turn directions. Smartwatches are typically controlled via one of 3 methods - buttons, touchscreen, or a rotating bezel. Make sure you pick the controls you find easiest to use. Some models have a microphone so you can use voice commands to dictate messages, open apps, and find information. Most smartwatches are touchscreen, however hybrid watches mean that you can still have a smartwatch which looks like a traditional watch. This is ideal for those who like the look and feel of a traditional wrist watch but still want the additional features that a hybrid has to offer. Battery life is different across all smartwatches but typically you can expect between 1 day and 1 week of battery life. If you don’t want to charge up every night, make sure you pick a watch with a longer battery life or traditional watch battery.